We’d love your help. Let us know what’s wrong with this preview of Soulless by M.V. Kasi. Sia Sampath is on a mission. Her ultimate aim is to search and destroy her enemy. Lying, deceit and manipulation were just some of the tools she had at her disposal. And for someone who was cold and emotionless like her, it wasn't supposed to be hard to achieve her goal. But she had one big problem. And it came in form of a stunningly attractive man, who was distracting her from her chosen path. So she dealt with him by turning him into collateral damage in her elaborate revenge plan. A part of which, required them to do the impossible—to marry and live under the same roof. Maintaining distance from her angry, resentful and a very much temporary husband shouldn't have been hard. Especially because all they had between them were hate, mistrust and a healthy dose of lust. But slowly and steadily, her defenses were beginning to crumble, and it was getting very hard to protect her heart or remain SOULLESS. To ask other readers questions about Soulless, please sign up. Will this be available on Amazon UK? The link does not match the book for the UK site. Souless by MV Kasi is quiet a compiling book to read . The Author have penned Ajay's and Sia 's character very well with Sia having nightmares by giving an appropriate effect to her book 'SOULESS' . The pace of the story like fast and furious movie . I liked their passionate encounters . I am eagerly waiting for next part if there is any .. Interesting plot with well developed characters. Fast paced story with moves back and forth between the past and present but not even once did I feel lost. The language and the story flow effortlessly. The book is unputdownable. The descriptions are detailed and the scenes can be easily visualized. The ending left me wanting for more, I am looking forward to reading the sequel of this book, 'Ruthless'. Loved the lead characters. The author has done an amazing job of building the characters and weaving their love into the story wonderfully. There is steam coming out of some pages and it was an enjoyable read. The ending is somrthing I did not expect and can't wait to read the next part, Ruthless!!! Child abuse is one of the most common types of abuse all over the world. Often such kid’s complain and pleas are ignored by their parents and guardians thinking that they are cooking up stories, thus making such kids suffer in silence. Result, it affects them so much that it breaks their confidence and in some cases their psyche is damaged beyond repair. In most of the cases children are abused by someone close and known to them. It's either a family member or someone known to family and child, Child abuse is one of the most common types of abuse all over the world. Often such kid’s complain and pleas are ignored by their parents and guardians thinking that they are cooking up stories, thus making such kids suffer in silence. Result, it affects them so much that it breaks their confidence and in some cases their psyche is damaged beyond repair. In most of the cases children are abused by someone close and known to them. It's either a family member or someone known to family and child, whom usually no one suspects or doubts, and therefore they escape from being caught and/or punished for their misdeeds. M V Kasi, in her book Soulless has dealt with this issue in a very brilliant manner. What happens when a nine-year girl, who has lost her parents at such a young age, is subjected to physical abuse for one year by a person whom she trusts and thinks to be a good person??? The abuse continues till a Good Samaritan rescues her by staging her false death and tucks her safely in an orphanage. Luckily she is adopted by a lady and is flown to Boston. But what affect did the abuse have on her? Her soul is damaged and her memory blocks the instances of those dreadful things which she had to go through. The innocent girl has turned into a reckless girl hell-bent on wrecking her life with her wayward ways; thus bringing disappointment for her adopted mother. But does Sia succeed in wrecking her life or she is successfully takes revenge from people responsible for her state?? Awesome story, liked the way the author has weaved the plot from past to present. Use of simple language, not too many characters are introduced or added. The manner in which Sia’s past is revealed to the reader is really commendable. Can’t wait to read what happens next in Ajay’s and Sia’s life in Ruthless. Does she get successful in avenging revenge from her uncle or she herself becomes an victim, again? Hats off to the author for writing on such sensitive issue of child abuse. The manner in which Sia’s abuse turned her into what she became is well described. Must read if you like romance, little bit of mystery and suspense. A path unexpected: finding the soul of a ‘Soulless’! I was hurting with her in the closed corners... it was so painful as if it had happened t A path unexpected: finding the soul of a ‘Soulless’! For detailed review check Book Reviews by Reshma Ranjan. SOULLESS is a beautifully fast paced and wonderfully knitted tale of Revenge. The author did a remarkable job in knitting up such characters and the plot and it didn't feel like a rush attempt and there weren't any loopholes in the story. The story revolves around Sia, an heir to a successful business empire. She is quite a strong, ambitious and talented girl. But there is something that keeps her awake at night. Something had happened during her childhood that she could not recall properly at fi SOULLESS is a beautifully fast paced and wonderfully knitted tale of Revenge. The author did a remarkable job in knitting up such characters and the plot and it didn't feel like a rush attempt and there weren't any loopholes in the story. The story revolves around Sia, an heir to a successful business empire. She is quite a strong, ambitious and talented girl. But there is something that keeps her awake at night. Something had happened during her childhood that she could not recall properly at first. For long she has been haunted by the bogeyman that had tormented her nights during her childhood. She is now a girl with a revengeful mission whose soul has been ripped out as a child. She now does all types of schemes and plots for the sake of her revenge but everything tends to change when she comes across Ajay, a handsome and successful young entrepreneur who is bent upon taking Sia out on a date in spite of her repeated cold detached refusals. Personally I have loved the characterizations of both Sia and Ajay and their sizzling chemistry. The general question that arises in the mind is who is this mysterious person that comes in her dreams? What did he do that she still trembles in her sleep almost every night? Will she be able to take her revenge? Though I feel like telling the answers but can’t do so without giving any spoilers. Overall this thrilling Romantic page turner is quite an interesting read. And wish to get hold of the sequel “Ruthless” as soon as possible. Sia Sampanth's love life is as mysterious as her pregnancy. Her The title of "Soulless" intrigued me from the moment Ms.Kasi requested a review. Generally, with such titles in the romantic genre, you imagine a heartless hunk for whom the damsel falls for. Women authors are changing the very thinking of the readers as more and more of us are exploring women in different roles for our stories. Soulless is none other than a young girl called Sia. A very young and a pregnant girl. The characters are beautifully delineated. Sia’s character seeks a lot of attention as she is mysterious, bit cranky, rude and soft at the same time. She wants to avenge someone, for which she plans and plots. During this course she comes across a man who changes her life. She is a tormented soul and when things began to heal slowly, her past knocks at the door. The story ends in such a way that it makes a way for the next part. I feel Sia’s portrayal have been the toughest task for the author a The characters are beautifully delineated. Sia’s character seeks a lot of attention as she is mysterious, bit cranky, rude and soft at the same time. She wants to avenge someone, for which she plans and plots. During this course she comes across a man who changes her life. She is a tormented soul and when things began to heal slowly, her past knocks at the door. The story ends in such a way that it makes a way for the next part. I feel Sia’s portrayal have been the toughest task for the author as she had to create a heartless character who was soft at some point. A beautiful fast paced story, a total page turner with a solid storyline and strong lead characters. The author did a fabulous job building up the characters and the plot and it didn't feel like a rush attempt and there weren't any loopholes in the story. Absolutely enjoyed this book and looking forward to reading the sequel of this book called 'Ruthless' and see how the story unfolds for Sia & Ajay. SOULLESS is the story of Sia who is cold, calculating and out for revenge. As the story progresses it becomes clear she was wronged. Abused and manipulated she manages to get the details of her abuser and wants retribution. She plans to exact revenge involves fulfilling the conditions so she can reclaim her parents fortune. She is rich but belongs to an even richer family unknown to most. She meets Ajay who is kind, handsome and a challenge for the cool Sia. There is instant chemistry and they fa SOULLESS is the story of Sia who is cold, calculating and out for revenge. As the story progresses it becomes clear she was wronged. Abused and manipulated she manages to get the details of her abuser and wants retribution. She plans to exact revenge involves fulfilling the conditions so she can reclaim her parents fortune. She is rich but belongs to an even richer family unknown to most. She meets Ajay who is kind, handsome and a challenge for the cool Sia. There is instant chemistry and they fall for each other. Even though it is quite a chase! This is not a typical love story, especially since there is very little love in the book. It is more about lust, revenge and killing the silent demons that nightmares are made of. The story works on many levels as Sia and Ajay are forced to be together. They have no choice or so it seems. The plot has some twists and surprises that make it a fast read even though the starting was a bit slow and it took me a couple of chapters to figure out what was she up to. The supporting characters of Anjali, Jo and Varun add to the mystery of the book. It is not a romance but a hot thriller. It also reminded me of the premise of the very successful, The Crossfire Series by Sylvia Day, which has abused and damaged individuals finding love and acceptance similar to Soulless. M V Kasi has managed to pen this book with a good balance of hate and mistrust even as love struggles to survive. The language is good but could do with a bit of proofreading, just some mistakes that seem to have been overlooked in a hurry. The story kept me reading since the story was so heart touching as I imagined Sia as a little girl facing the world alone. She tries to be a heartless person but is not always successful and I could see her falling for Ajay. He too becomes a friend, a bit reluctantly at first. I was disappointed to know that it was not mentioned the book has a part two when I signed up for the book. I was half way through the book by the time I knew so now I wait for the finale. The book has a second part – Ruthless and I eagerly wait for it so I can understand all the connections between Varun, Anjali, Sia, and Ajay. They need to have their story told. This is the first book in the Revenge Games Series, which is a duology, featuring this book and its sequel, Ruthless. It's also the very first book I've read by the author, so going in, I had absolutely no idea what to expect. But after reading Soulless (and Ruthless), I am glad I decided to check out this series, and the author, because both these books were pretty interesting & relatively unique reads in this genre. 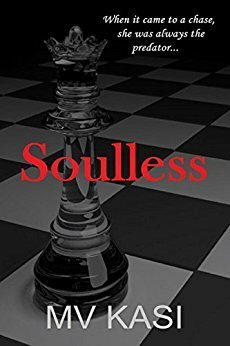 Soulless is a fast paced, romantic thriller, which deals with some very ser This is the first book in the Revenge Games Series, which is a duology, featuring this book and its sequel, Ruthless. It's also the very first book I've read by the author, so going in, I had absolutely no idea what to expect. But after reading Soulless (and Ruthless), I am glad I decided to check out this series, and the author, because both these books were pretty interesting & relatively unique reads in this genre. Soulless is a fast paced, romantic thriller, which deals with some very serious themes of child sexual abuse & mental health. In-fact both these themes are central to the story, and considering how well the author has managed to incorporate them in an integral, yet matter-of-fact way, while being responsible and sensitive, shows that she has done a fair amount of research on the subject, and that kind of effort is something that is truly commendable. Moreover, I really enjoyed the fast-paced narrative, which hooked me from the very beginning, and held my interest through the many twists & turns, right until I turned the very last page. Though speaking of the last page, I must warn you that this book ends on a cliffhanger, so it can definitely not be read as a stand-alone (if that's what you are looking for). However, the story is continued & concluded in its sequel Ruthless, which I am sure you will enjoy just as much, if not more. Having said that, I must say that this book definitely needed one more round of proof-reading, as the small typos & errors were kinda annoying in an otherwise gripping narrative. Nonetheless, I'd still recommend this book (and series) to fans of this genre, as this is a subject that certainly needs more awareness, and it's also a tale very well told. This book just pulls you in! Writing a review for every book is a different experience. With some books, the words just flow. The thoughts and feelings are simple and are right there to be put down on paper. Some take a little mulling over. But till date no book has put me in such a quandary as “Soulless”. No...no...no... don’t get me wrong. It wasn’t because I didn’t know what to say. It was because I didn’t know where to start and how to say it all. I was so scared of not being able to do justi This book just pulls you in! Writing a review for every book is a different experience. With some books, the words just flow. The thoughts and feelings are simple and are right there to be put down on paper. Some take a little mulling over. But till date no book has put me in such a quandary as “Soulless”. No...no...no... don’t get me wrong. It wasn’t because I didn’t know what to say. It was because I didn’t know where to start and how to say it all. I was so scared of not being able to do justice to the book. The first chapter itself had me hooked. I was like. “OMG! Can one really be that unfeeling?” And from there on till the end, it just pulled me in. The book is a vortex of emotions: love, lust, fear, hate, anger, distrust, betrayal. When I review a book, I normally give it a quick read just to gauge how interesting it is, to get the overall feel of it and then I read it again for the finer details, before I sit down to pen a review. With “Soulless” every time I read the book, I got pulled in so deeply, I got lost in the emotions of Sia, the protagonist. I wondered at her cold blooded pursuit of revenge, I cried with her as she relived her nightmares, I felt the heat when she was in bed with Ajay. I just kept going back to the book again and again, forgetting that I had to write about it. When I came to the end, I was like, “No...no..no... I want more. What’s going to happen next?” I must say, I am really waiting for the sequel “Ruthless” but M.V.Kasi will have her work cut out to keep it as gripping as this one. I am very ‘kanjoos’ (stingy) when it comes to giving 5 stars to any book, but I definitely think “Soulless” deserves it! This is one book you will read over and over again! I became a huge fan of MV Kasi's writing style when I read The Singham Bloodlines series written by her and then when I heard about this series, I was intrigued by the nomenclature and subsequently, the blurbs. As I started reading this book, at first, I didn't care for the heroine, Sia, who came across as frigid, unemotional and manipulative but as the story progressed and I got a better understanding of the protagonists and I understood why they were as they were. There is nothing soulless about this book. It is a soulful story with intense emotional play and revenge that drives the lives of the protagonists of this book. The characters are flawed and definitely fall in the grey area but their past that led them to their present behavior is heartwrenching. I started out in indifference to Sia then went to sympathy and then went to empathy. While the expertly planned twists and turns kept me constantly in a surprised state, I sat engrossed with intense emotions assaulting me throughout this book. MV Kasi has bravely taken up a social issue that doesn't often get the proper attention and made the tragedy and the heartbreak of the victims seem like our own. My throat filled with tears as did my eyes while my heart broke when I read this book. The story continues in the second book, Ruthless and I am so eager to read it. This is a story about how Child abuse can severely impact the psychology of the victim. People who are fortunate to have a happy childhood may not easily co-relate to the trauma which a child may have to go through, in case of physical and/or mental abuse at a tender age. Book1-Souless is more about Sia who plans to take revenge against her uncle who had repeatedly raped her at the age of 9 until she was fortunate to have escaped with the help of her teacher. Book2-Ruthless is more about her husband Ajay who has also had a not-so-happy childhood after killing his own dad when he was seven followed by suicide by his mom a bit later. His mom was the teacher who had saved Sia from her monster uncle. Soulless, another blockbuster or Bestseller from MV Kasi. I love the way she weaves multiple topics into one story. It will haunt you and keep you hooked. The emotional turmoil it caused in me. Kudos to MV Kasi for bringing those emotions out in her characters and the reader too. By the end of it I was boiling and was thinking of all kinds of horrific punishments for the villain of the book. The story goes at a steady, fast pace throughout the book. I couldn't think of any part which was not needed. This book is interesting and unputdownable!!! It is fast pacing, thrilling, with a lot of suspense and have many unexpected twists!! Author explains about how Sia Sampath, an emotionless woman, is on a mission to search and destroy her enemy..She is ready to do anything to achieve her goal..She is attracted towards Ajay and she uses him for her own personal agenda!! Situations force her to marry him and live with him under the same roof..What happens next forms the rest of the story. My rating for This book is interesting and unputdownable!!! It is fast pacing, thrilling, with a lot of suspense and have many unexpected twists!! Well woven tale that sticks to the plot at the same time springing surprises every now and the. Never a dull moment seems to be the philosophy of the author. Truly, an interesting read! Woah! I did not see that coming! At first I questioned if I wanted to continue this book but I'm glad I continued. I'm going to start the second book right now. Eager to read 2nd installment, Ruthless. It was a good read. Had fun reading the book. In future I am sure someone will make a Web series on this book. Let me first commend you on sensitively handling such a difficult topic. The description given into the life of characters is very good. I was easily able to feel the connection with the characters. Soulless is a revengeful tale of Sia, heir to the successful business empire – Blush International. She is a strong and ambitious girl. But she is also bold, rude and reproachful and that makes her different. She plans and plots with the sole aim of avenging someone – someone who torments her and gives nightmares- someone who has made her fearful of her own shadow at night- someone who has ripped her soul out as a child. Sia had been adopted when she was nine and had lived with her aunt in Boston Soulless is a revengeful tale of Sia, heir to the successful business empire – Blush International. She is a strong and ambitious girl. But she is also bold, rude and reproachful and that makes her different. She plans and plots with the sole aim of avenging someone – someone who torments her and gives nightmares- someone who has made her fearful of her own shadow at night- someone who has ripped her soul out as a child. Sia had been adopted when she was nine and had lived with her aunt in Boston. She had given her aunt rough time as she suffered from sever psychological issues, drug addictions and sleep disorders. She had also attempted several suicide attempts ever since she was thirteen. It was Dr. Patel who helped her through rehab and arrive at her own answers and soothe herself. After her aunt’s death, Sia moves to Hyderabad to succeed in the mission she had been plotting since long. But then she meets Ajay, a handsome successful entrepreneur who seems interested in her. Sia is drawn to Ajay’s charisma and charm. Though she didn’t want to have an emotional attachment with her prey, Ajay seems to fit the bill. They get intimate, but much to Ajay’s surprise, she leaves him the very same night. He is heartbroken, but succumbs to his best friend, Jyothika’s yearning in getting married to each other. They have similar life aspirations and Ajay feels it is for the good. Meanwhile, Sia is guilty of exploiting a good and honest man but is also relieved that her plan had worked out. She now had Ajay’s baby in her. The news comes as a shock to Ajay, but he decides to keep his baby under sole custody and proposes marriage to her. He also urged to live in with her until the baby was born and that sets Sia in paranoia. She doesn’t want him to know of her childhood trauma and fears. She doesn’t want him to know of the demons of her past and the dark twisted secrets. But moreover, she doesn’t want to hurt him and pull him into something too deep that it felt like drowning. Though it was a marriage of convenience, they realize they are well-suited for each other. She begins to share secrets kept inside her withered heart and didn’t want to let go of him ever. He had made her dream and hope. He had made her alive and long for happiness that now she has a brand new phobia—the fear of abandonment. Who is Sia scared of? Who is the monster from her nightmares? What happened in her childhood that she craves for vengeance? Why take advantage of Ajay by having his baby? Kudos to the author for writing about such a sensitive topic as child abuse. It is relevant in today’s age, especially since many parents tend to ignore their child’s cries and pleas as made-up tales. The characters are defined beautifully and Sia’s portrayal needs a special mention. It was one hell of a ride getting to know her, her internal battles and her fight against dreads and dismay. The fear and trauma of a sexually abused child is delineated to perfection and the author’s research on anxiety, PTSD, addiction and repressed memories has come into use. Soulless is a revengeful tale that brings out the psychological repercussion of unresolved traumatic childhood issues with a lot of jaw dropping twists. Sia, our protagonist is an heir to a successful empire, Blush International. She is a strong, ambitious and talented with severe psychological issues that keep her up at night. She is a girl with a revengeful mission whose soul has been ripped out as a child. She moves to Hyderabad from Boston to accomplish her operation when she meets Ajay, a ha Soulless is a revengeful tale that brings out the psychological repercussion of unresolved traumatic childhood issues with a lot of jaw dropping twists. First book I read by the author and I really enjoyed it. I'm looking forward to the new book "Ruthless" to see how Sia and Ajay's lives turn out.